This is what you do: If you're pregnant and you're worried about your water breaking in public, to avoid embarrassment, carry around a jar of pickles. Then, should anything untoward happen, you simply pull out the jar from wherever you've secreted it, smash it on the ground (where the pickle juice will mix indistinguishably with the amniotic fluid) and say, "Oh, how clumsy of me," or words to that effect. 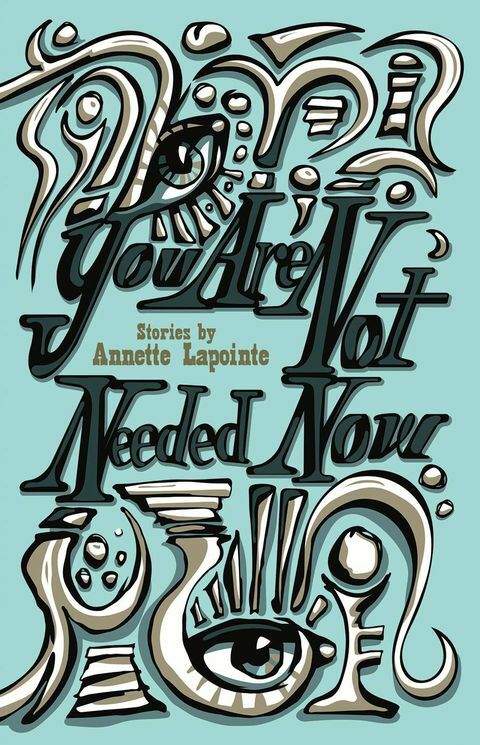 This is the advice given to Nicole, a pregnant housekeeper, in Scatterheart, an early story in Annette Lapointe's debut collection, You Are Not Needed Now. The prenatal instructions become the set-up for an outlandish, darkly humorous finale that should be more than sufficient to warn off any readers made uncomfortable by material that is tough, raw or edgy. Lapointe, a Saskatchewan-born resident of Grande Prairie, Alta., is not a writer liable to pay much mind to her readers' delicate sensibilities. Her stories are like the Prairies themselves: harsh and austere, but imbued with a rugged beauty. They can also be downright weird. The final story in the collection, Clean Streets Are Everyone's Responsibility, begins with a startling declarative sentence: "The city issued a memo early in the snowmelt making bus drivers responsible for the collection of hands." This is not a metaphor: in Lapointe's story, the first Winnipeg thaw of the year has uncovered multiple severed hands that have been discarded like trash in city snowdrifts. One of the shortest stories in the book, Clean Streets Are Everyone's Responsibility acts as a kind of coda to the collection, melding grotesquerie and humour in a manner similar to that of the pickles in the earlier story. What's most impressive is the ease with which Lapointe layers her expressionistic – not to say patently absurd – scenario atop a presentation that is almost defiantly naturalistic: "They have a little fact sheet they give out to the curious. It lists the number of men's hands and women's, and how many there were by race, roughly, and odd little things like the fact that while lots had tan shadows, three actually had wedding rings on. Seven had tattoos." The juxtaposition of bizarre subject matter and realistic approach runs through numerous entries in You Are Not Needed Now, as does the appearance of preserved body parts. Mrs. Gamble, the woman whose house Nicole cleans in Scatterheart, keeps a desiccated human heart in a box (among other remnants of deceased relatives); the title character in The Witch Invites Herself to Dinner collects human teeth, some of which she sends to her adult daughter. The protagonist of Man Gave Names to All the Animals slices off a piece of her palm while working in the meat department at Safeway; her boyfriend, a "tiny, impossible boy-man with benign sociopathic tendencies," saves the severed flesh and returns it to her before abandoning her with a stack of unpaid credit-card receipts and a small menagerie of house pets. The repeated appearance of severed body parts is symbolic of the absences created by serial runaways in these stories: Parents abandon children, lovers disappear and rootless characters struggle to find some sort of meaningful identity or place of belonging. In one of the collection's most heart-rending stories, two itinerant travellers, Robin and David, are thrown together on a cross-country bus; when they get tossed off for public lewdness and drinking, Robin receives an unwelcoming reception from a married friend in Winnipeg. Refuge in these stories is elusive, but it is to Lapointe's credit that she treats her characters with seriousness and abiding empathy, allowing readers to come to a deep understanding of what motivates them, even when this understanding proves unattainable for the characters themselves. If Jessica Westhead's stories are tonally distinct from Lapointe's, they nevertheless evince certain superficial similarities, including one story in which a pregnant character's water breaks. In Gazebo Times, the protagonist, Conrad, is a would-be sketch comedian who works the falafel stand in a mall food court. He abandons his post for a half-hour lunch break on the same day that his pregnant wife arrives to surprise him and a gunman holds the food-court patrons hostage. The situation in Gazebo Times is emblematic of the kind of high-concept scenario Westhead favours in these stories. The Prize features a couple who plan to strike it rich by building an escape room, and the hated employer one member of the couple locks inside. He Will Speak to Us focuses on the father of a teen-idol pop singer, who waits among a group of rabid young fans for his son to make a public confession about a fatal assault. The Lesson is a monologue in which a professional wedding DJ instructs a new recruit on best practices for a successful event. Like Lapointe, Westhead's pervasive subject is alienation, but she replaces Lapointe's gritty poise with an attitude that is quirkier and more insouciant. Her characters are just as liable to feel the ache of loneliness and the inability to connect with, or understand, even those closest to them, but Westhead's humour is gentler, her approach less acerbic. Dennis, the protagonist of Empathize or Die, wanders unwittingly into a restaurant that is holding an open-mic poetry night. "He had no idea," Westhead writes. "All he wanted was a burger." By the end of the story, Dennis will be moved to volunteer to step up to the mic, in a performance that is withheld from us, but is likely to be excruciating. Empathize or Die showcases Westhead's strengths: her goodwill; her authentic feeling for characters who struggle mightily despite an almost inconceivable lack of self-awareness; her preternatural knowledge of precisely where to end her stories. This is not to say that there is nothing to quarrel with in Things Not to Do. Too many of the stories feature highly symbolic dream sequences; an artificial device at the best of times, their repeated appearances across successive entries in the collection begin to resemble an authorial crutch or default setting. But Westhead's writing is infused with a generosity that is infectious: It draws a reader in and demands an emotional accounting. Westhead's collection, like Lapointe's, is characterized by the negation in its title, and together these two books examine denial in its various permutations and combinations. Yet both books feel paradoxically like affirmations – even in the face of disillusion and anomie, their characters find a reason to persist. Like Dennis in Empathize or Die, they may go down in flames, but by God, they will take the stage.